Following an extremely successful first year (2018), we are delighted to announce that "Egroeg" will be available for B&B in 2019. 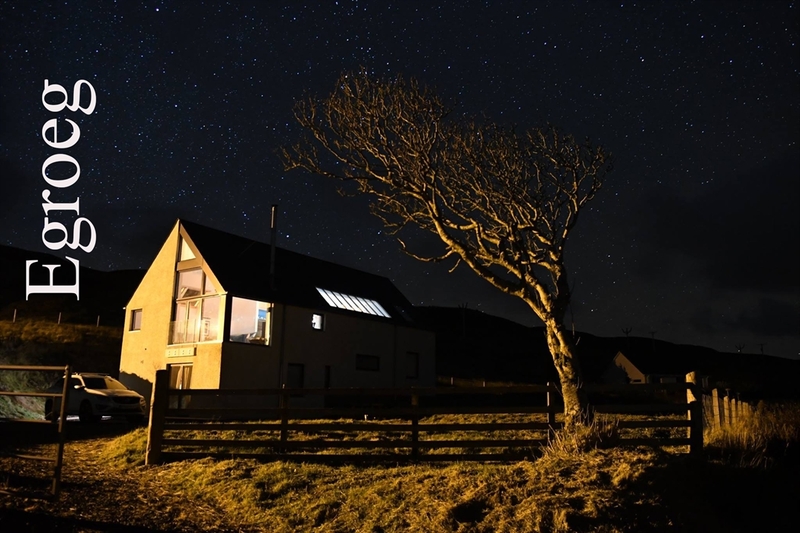 If, like us, you like to explore the less well-know parts of Skye - whilst still being within easy travel of the "hot-spots" - then we invite you to join us for an experience that we hope you will find both relaxing & memorable. Note: For "repeat" guests we are pleased to offer our rooms at our "2018" rates - please let if you have stayed with us before. GoToStKilda - For visitors planning on making the trip out to St. Kilda, Egroeg B&B is only 5 minutes drive from the slipway at Stein. If you are interested in using Egroeg B&B as a "base" for your trip, please do get in touch. 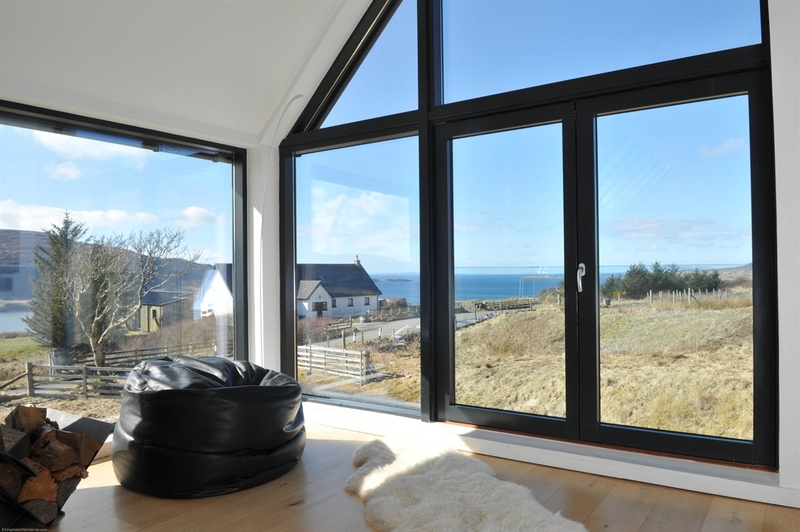 Egroeg - Egroeg is a contemporary, architect designed, “upside down” house – with three guest bedrooms on the ground floor and superb views - across The Minch, to Lewis & Harris - from the split-level first floor, where the living area and kitchen-dining area are all seamlessly integrated into a large open-plan living space. 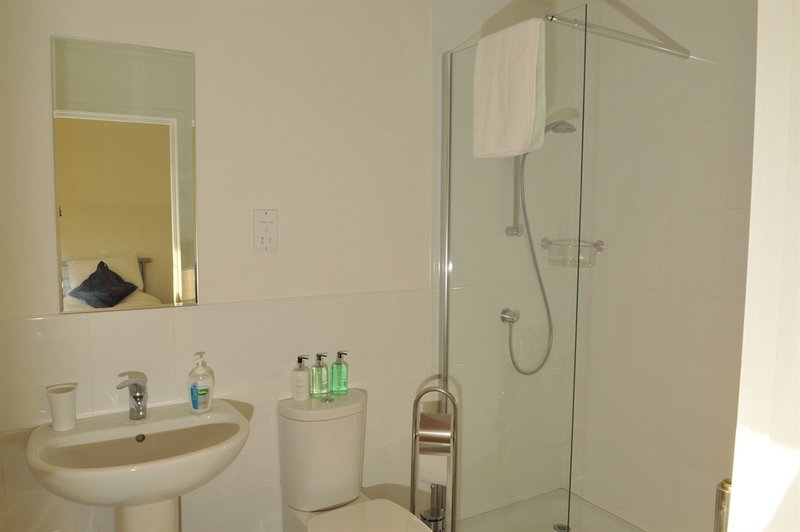 Bedrooms – Two “double” (en-suite shower-bath) and one “twin” (en-suite shower). All bedrooms are carpeted throughout and have built-in cupboards, complete with storage baskets available for guests use during their stay. En-suite - Complementary toiletries – Scottish Soaps (Sea Kelp). Bathrobes available on request. Breakfast – Traditional Cooked or Continental breakfast will be provided – normally between 07:30-09:00 but times can be adjusted on request. 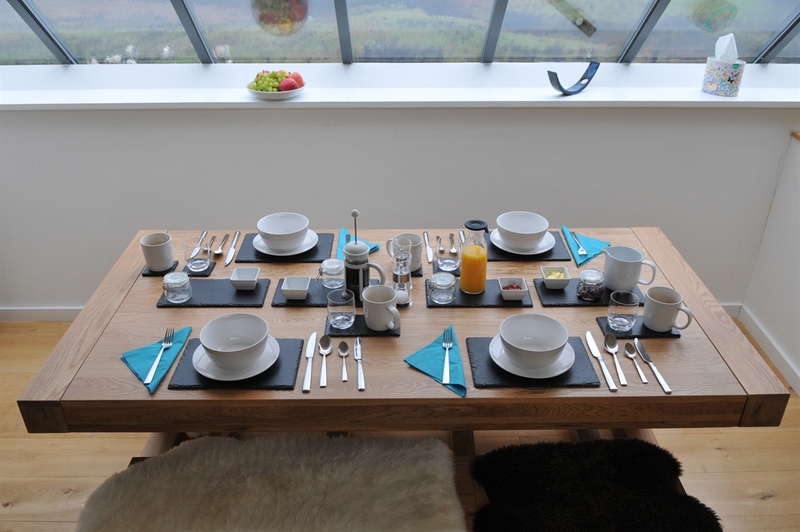 Tea & Coffee – Guests are welcome to make use of the kitchen facilities whenever tea/coffee is required. 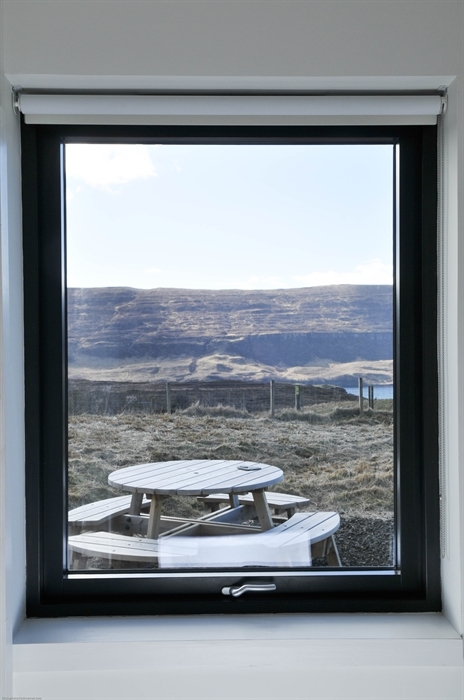 Evening meals - There are a number of restaurants within easy drive (15 minutes) of Egroeg B&B - without the need to drive into Portree. There are two places in Stein (one restaurant and one public house) that serve evening meals. Details will be included in the Deposit Payment confirmation email. Dietary Requirements – If you have any specific dietary requirements, please contact us (by email) at time of booking. Living area (first floor) - In the evening, guests are welcome, and encouraged, to share the first floor living area with both the owners & fellow guests. 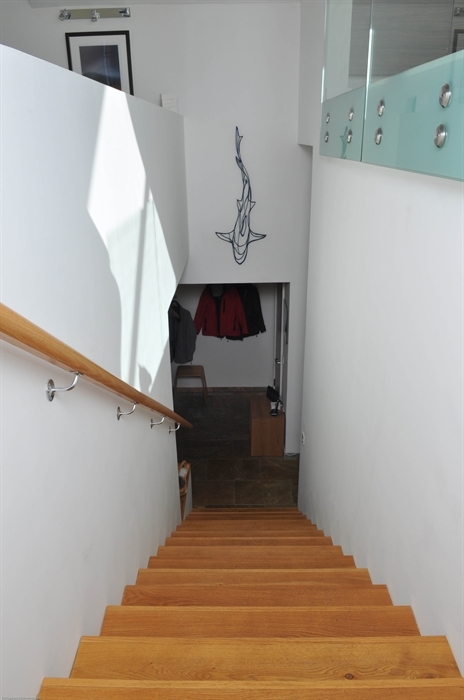 Children – The open plan design of the first floor includes a low wall (100cm) between the lounge and the stair-well. Therefore, we regret we cannot accept bookings for family groups that include minors (less than 16 years old). 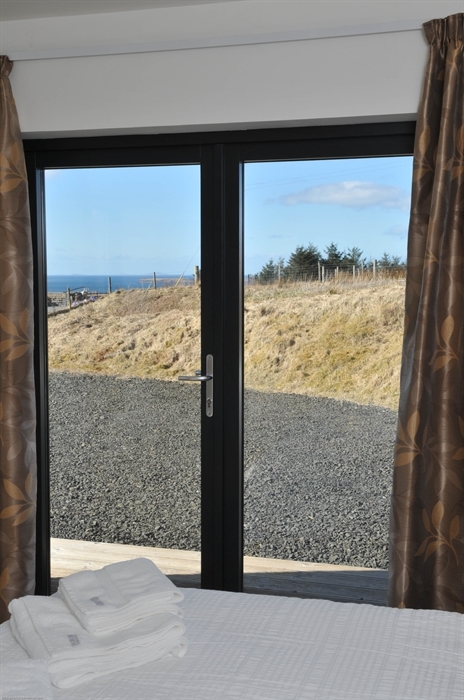 Pets – Lochbay is a crofting community (sheep farming) and therefore, we regret we cannot accept bookings from guests with dogs - or any other animals (sorry). 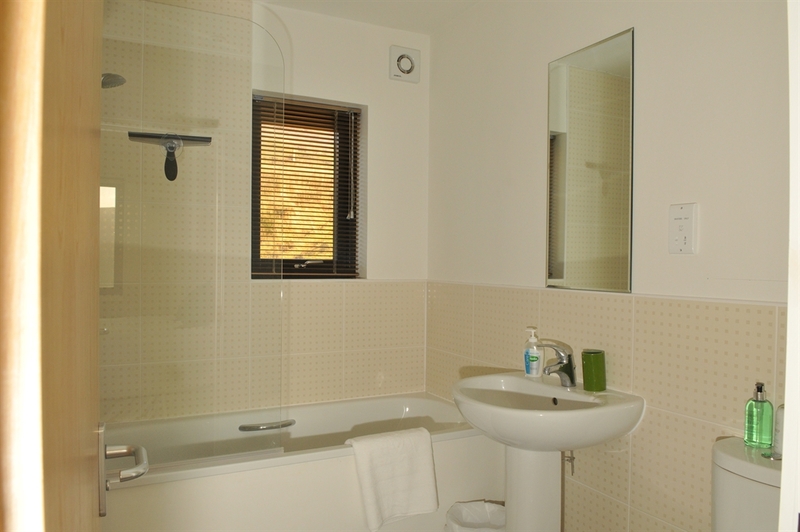 Room Servicing - All rooms will be serviced daily. Tariff (room) – (See below). The Isle of Skye has a plentyful supply of things to do & places to see - far more than can be achieved in a week. A list of suggestions will be included in the Deposit Payment Confirmation (email). Parking – ample parking (3-5 cars). 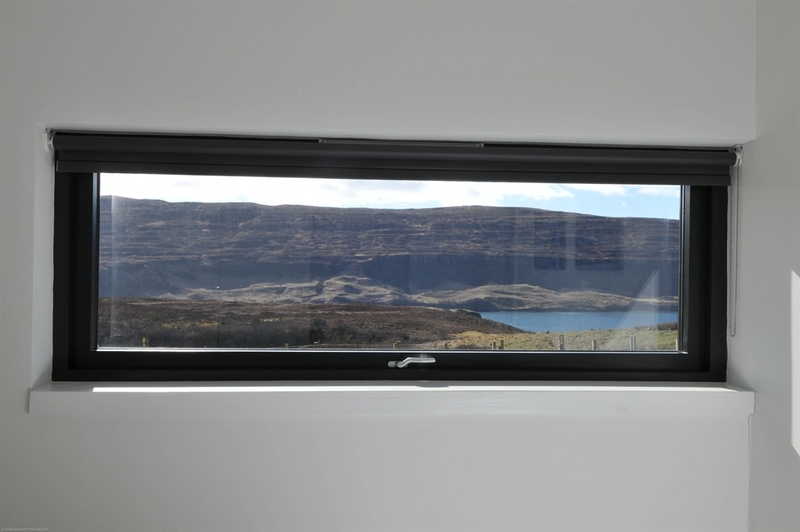 Television – a large flat-screen TV (FreeSat) is located in the communal living area and is available for use by guests - but the stunning views should keep you fully entertained. 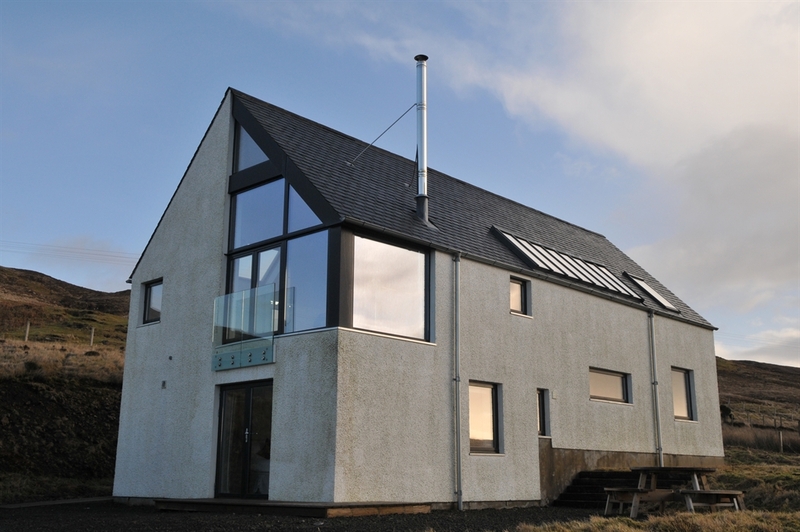 Heating – underfloor heating throughout the ground floor supplied by air-source heat pump. 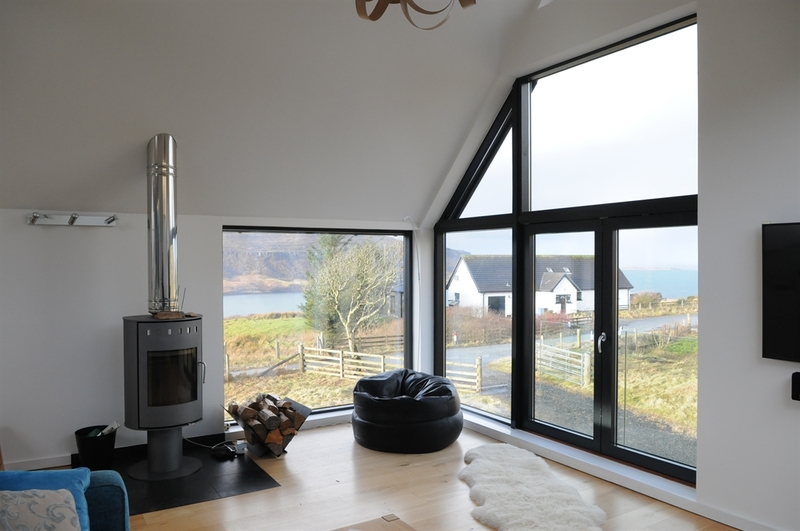 Windows – each room is well lit by individually tailored windows, designed to maximise the views over Lochbay. 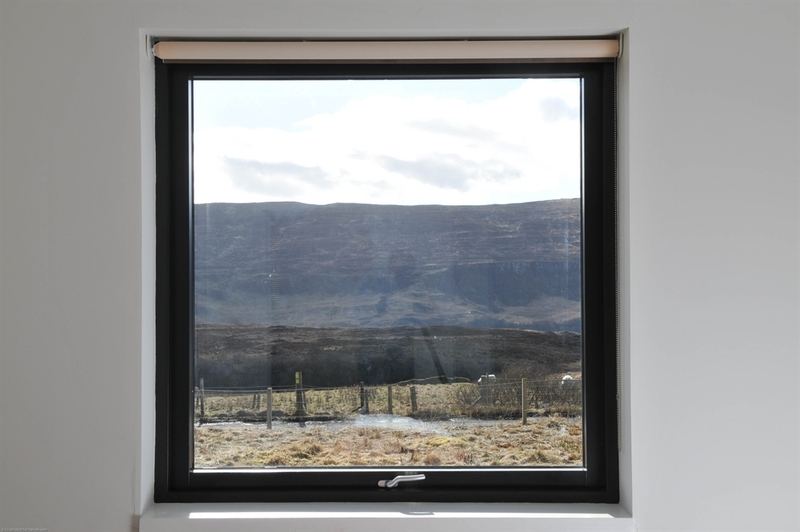 Blackout blinds - During the Summer months, the days are long and the nights are short. 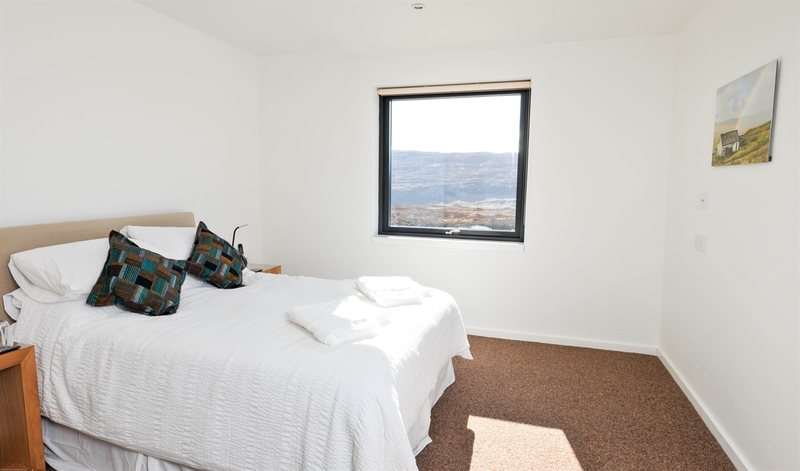 All rooms are equiped with blackout blinds &/or heavy curtains. 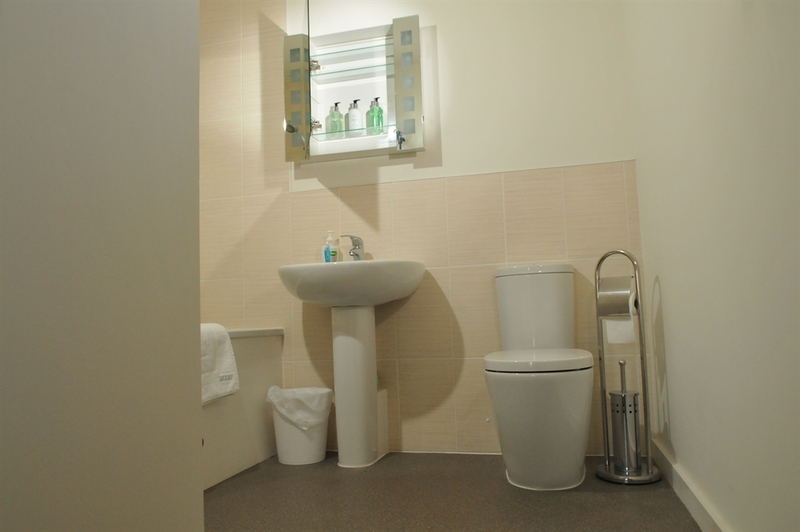 Utility Room facilities – washing machine, tumble dryer & drying rack – these facilities can be made available to guests on request. Smoking – outside only (please). Slippers – We respectfully request that guests remove their outdoor shoes in the entrance lobby - slippers or socks are the preferred indoor footwear. Safety - Egroeg is fitted with smoke alarms and equipped with fire extinguisher and fire blanket. USB - Recharging plugs (triple) available in each bedroom. Enquiries/Bookings: - All bookings must be made by internet (VisitScotland.com) or email (see above). PLEASE include the names of ALL guests in the initial booking. Same-day Booking - Sorry, but we cannot accept "same-day" bookings. Block Booking - If you wish to make a "block" booking for all three rooms (6 guests), please email us directly - we will "reserve" your requested dates and, if mutually acceptable, make the booking on your behalf. Egroeg B&B reserves the right to decline "block" bookings (all three rooms) - this will only be done for operational/logistical reasons. Invoice - Once we have received notification of your booking we will - normally within 24hrs - send you a Confirmation Invoice (PayPal) which we ask be paid within 7 days. Payment(s) - At present we do NOT accept credit card payments. The following payment methods are available; PayPal, Bank Transfer (BACS), Cheque (UK Banks ONLY) or Cash (on arrival). Single Occupancy – A discount (20%) is applied. Liability – Egroeg B&B will not accept liability for injury or loss during your stay at Egroeg B&B. Travel Insurance - Guests are strongly advised to arrange appropriate Holiday Cancellation insurance.